Senior Dillon Collins runs in transition to score a layup as the senior finished with 12 points in their 66-55 victory over the Wildcats. -PC: Ron Gates. Following the Trojans quarterfinal performance, they were able to easily handle the Riverton Rams 57-23. In the semifinals, Girard (17-3) faced the Caney Valley Bullpups (14-7) as the two teams battled it out for a shot in the sub-state championship. The Trojans were able to get the upper hand in the first going on a 7-0 run midway through the quarter. Caney kept within distance off hot shooting from outside, but Girard would lead 15-13. Both teams exchanged baskets throughout the second. Caney Valley took the lead early in the quarter as their outside shooting showed no signs of slowing down. Grabbing their largest lead of the game, the Bulldogs led the Trojans 31-26 at halftime. Caney kept their momentum going in the third as they would execute off Trojan turnovers. The Bullpups could not miss a shot as they led Girard 51-41 at the end of the quarter. 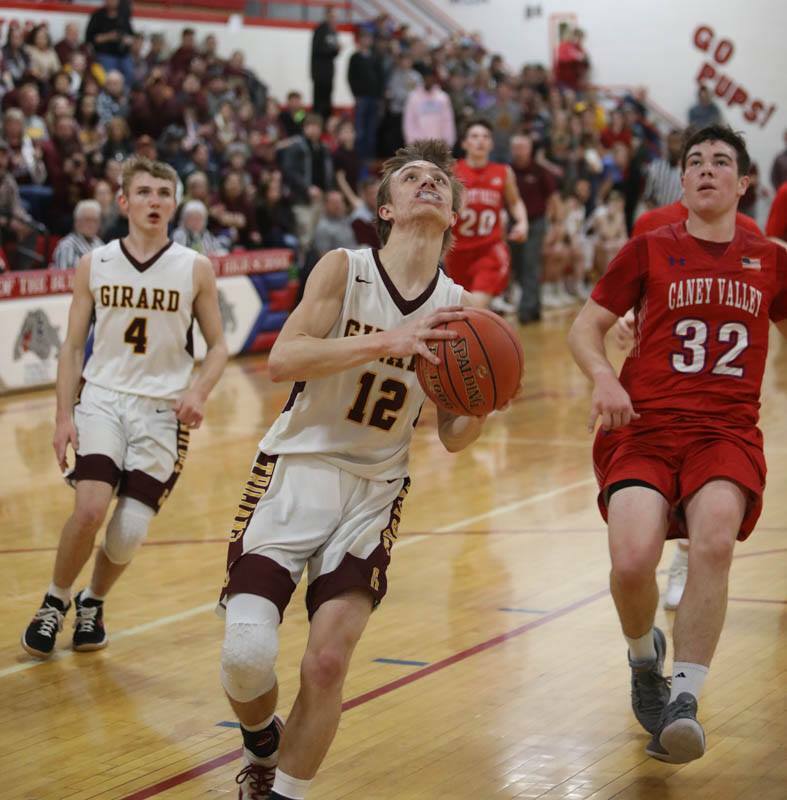 Girard flipped the switch in the final quarter going on a 10-0 run with all of the points coming from senior Caleb Muia. Caney Valley’s hot shooting quickly turned cold led by the Trojan’s stifling zone defense. Muia scored 16 points alone in the fourth quarter, providing much needed offensive production. Outscoring the Bullpups (14-7) 25-4 in the fourth quarter, the Trojans (18-3) hung on defeating Caney Valley 66-55. Muia had a career night for the Trojans finishing with 40 points on the night. Senior Dillon Collins provided a spark ending the game with 12 points. Other key contributors include; Doherty (6), Troike (4), Worrell (4). The Trojans are set to play in the Class 3A Caney Sub-State Championships Saturday, March 2 at 6. In a rematch, tied 1-1, Girard will face the Baxter Springs Lions (17-4) in a highly anticipated showdown for a state berth.